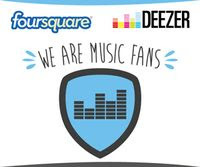 Music streamer Deezer has formed a marketing partnership with Foursquare. 7 concert check-ins on Foursquare and users can win you a 3-month Deezer Premium+ subscription. The promotion extends to 15 countries: Brazil, Mexico, UK, Ireland, Indonesia, France, Belgium, Netherlands, Luxembourg, Spain, Italy, Germany, Australia, New Zealand and Poland. The partnership is part of location check-in app Foursquare's increased focus on international growth. 1 – Like the Deezer page on Foursquare. 2 – Go to concerts: 1 check-in unlocks level 1, 2 more unlocks level 2, and 4 more unlocks level 3.